Peaceful & Private. 5 min walk to the beach! 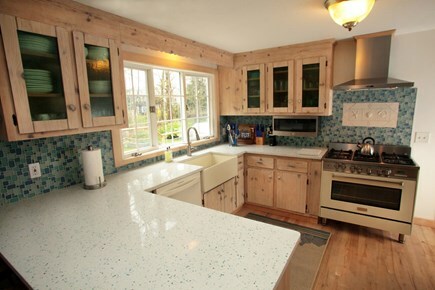 Remodeled Open Concept Kitchen flowing into Cathedral Sunroom. Newly renovated Master Bedroom bath with creative details. New Queen Bedroom set w/Gel infused mattress, Cedar Wainscoting. Forest Beach is 5 min walk. Hear the Waves at Night! This year-round, Open Concept, quaint home has 3 bedrooms, 2 baths with a large two-level outdoor deck with electric awning creating a outdoor room overlooking a beautifully landscaped yard with flower and herd gardens. Private and peaceful situated at the end of a cul-de-sac. 5 min walk to Forest Beach. Great central Location. Sleeps 6-8 comfortably and has a queen sofa bed for up to 10. All rooms are nicely appointed with your comfort in mind. The master bedroom has a private bath, new king memory/gel infused mattress & AC. The guest/kids bedroom has four nautical inspired design bunk beds and AC. The 3rd bedroom has a queen bed with a new Simmons Beauty Rest mattress. The sun-room has a queen sleeper sofa. The spacious, open concept fully equipped eat-in kitchen has a portable AC unit, a large skylight, and a new, high end 'Elite' dishwasher. The kitchen opens to the living room with fireplace and bright sun room with cathedral ceiling and more skylights, with a slider doors leading out to the spacious rear deck overlooking the flower beds and herb gardens. This outdoor space has a new commercial infrared stainless steel grill and retractable awning, creating a comfortable outdoor room. This home sits south of Rte. 28, the preferred Nantucket Sound ocean side, and at the end of a cul-de-sac where kids can safely run, bike and play while parents enjoy this great living space. It is very quiet with bird life galore, and so peaceful that all you hear at night is the ocean. This home comes equipped with a variety of amenities including Xfinity on Demand cable TV and a new flat screen smart HDTV in the family sun room with Blu-Ray-DVD. The kids room also has a TV with Wii player. 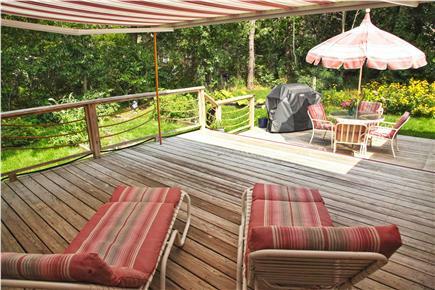 The large outdoor deck has an electric retractable sun awning & commercial gas grill. Also included is a new front load washer dryer with the steam sanitizing features, ceiling fan & wireless internet access. All the creature comforts you would expect at home. The home has been totally newly renovated with freshly painted walls, a new kitchen, and maple hardwood floors throughout. It's ready for the 2014 season! 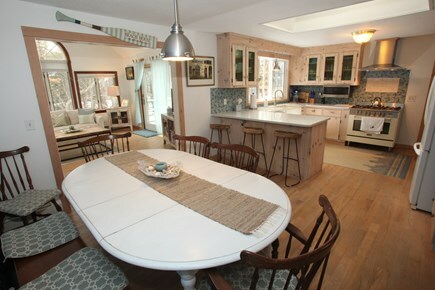 This bright, exceptionally clean, relaxing cape style home is only a 5 to 10 minute walk to Forest Beach, a natural beach on the warm waters of Nantucket Sound. Spend your days relaxing in your beach chair or take advantage of the fair winds to windsurfer or sail at Forest and Pleasant beaches. When you get hungry, it’s an easy walk back to the house for lunch, or choose to walk right up to the local coffee shop or restaurant. Additionally, the 26-mile Cape Cod bike trail is only a 5 minute ride and easily accessed. There is a newly resurfaced public tennis court, basketball hoop, and a kids climbing play area within 5 minute walking distance. The outdoor shower is perfect for cleaning up after a day at beach. Centrally located at the “elbow” of Cape Cod, Chatham is a true Cape gem, said to be as quaint as Nantucket without the boat ride. Enjoy Main Street and its unique shops, restaurants, theaters and inns. Relax at the scenic beaches perfect for sunning, swimming, boogie-boarding, kayaking, windsurfing, or sailing. If the salt water is not your thing, try one of the calm, spring-fed, glacial kettle ponds, a great alternative for young kids. For fun activities, enjoy the public golf. Check out the 26-mile Cape Cod bike trail perfect for both avid cyclists and families. For some unique adventure, hop on a water taxi at the Chatham Fish Pier to your private space on secluded South Beach or explore Monomoy Island. Interior is all one level. Maximum 3 spread out steps entrance. We loved everything about this home. It was well maintained, comfortable, roomy and clean! 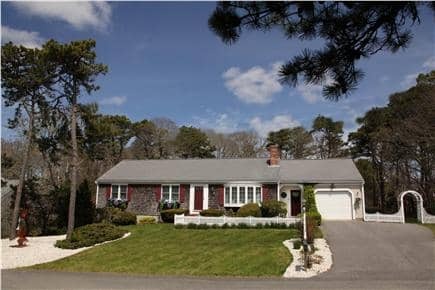 It was conveniently located to both Chatham and Harwich allowing for easy access to both towns' beaches. The homeowners provided a wide array of bicycle choices so we did not have to travel with our own, a big plus! Our only regret is not staying an additional week. Highly recommend this home! Incredible home! Beautifully maintained! We loved our stay at “Cape Escape”! 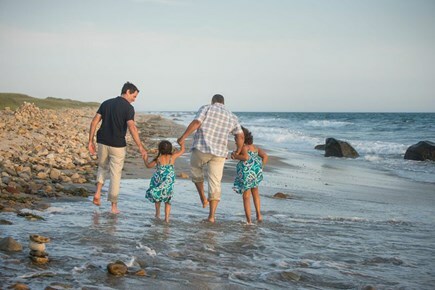 We have been vacationing at a family home in East Harwich since 2013 and are familiar with the area. This year we celebrated our wedding with 18 family members and needed a 2nd home. We could not have made a better choice! The location, home and all of the amenities were everything we had hoped for. We hope to have another opportunity to stay in this wonderful home! We are so glad you had a great time, Carla. We look forward to hosting your family again. Perfect place for a family vacation. Close to a beach and a bike trail, lovely quiet neighborhood. The house is very well maintained, comfortable, clean and fully equipped. Most of all I was impressed how well the kitchen was equipped. I've never seen such a great kitchen in a rental property. We loved that there were bicycles that we could use. It was very enjoyable. John, the owner, was very friendly and responsive from the time of enquiry up until our departure, and even after (took care about our stuff that we accidentally left). Unique & wonderful house in Chatham!! John & Ruby are really superb hosts, very accommodating, making sure we were all set… to our delight, John even texted to let us know the house was ready a few hours early! Food in the area was fabulous. Burritos from the Corner Store, dinner at Karoo. The Talkative Pig Bistro and Pisces Restaurant are just a few minutes on foot. The central “Elbow of the Cape” location of the home is really optimal for exploring all the area has to offer. Great beaches are really close, shopping in picturesque downtown Chatham was awesome… It really was the best location we’ve stayed at on the Cape. The house was extraordinary - the children’s nautical themed bunk beds are surreal - our daughters wanted to spend all their time in there. 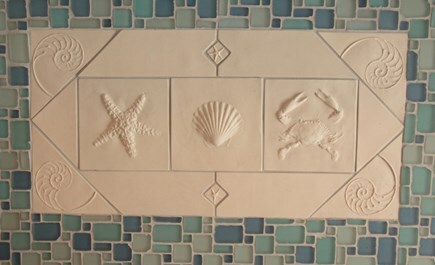 The beach house decor is updated and welcoming, the right combination of modern & chic, very relaxing and inviting. 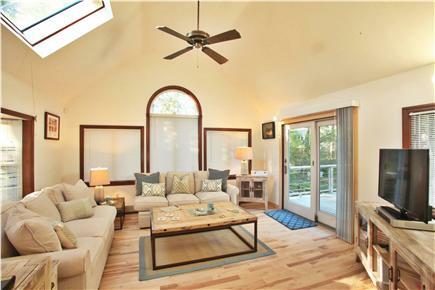 Exactly what I want my beach house living room to be like… someday! The kitchen had all the necessities and then some! The Cape Escape is a great place for a relaxing vacation. The home is beautifully decorated and very inviting - the owners have taken great care in providing a warm and comfortable atmosphere. It's conveniently located in a nice, quiet residential area. We enjoyed all that Chatham has to offer - great restaurants, beaches, bike trails and a quaint downtown area which is nice for strolling...We would definitely recommend this property to family and friends. We thoroughly enjoyed our stay!! We had a wonderful week in Chatham. The house was comfortable, clean and well stocked with all the necessities. We really enjoyed the quiet neighborhood and the short bike ride to Forest Beach.It's a great place for young and older ones alike! My family has always had a home in Chatham. When I was growing up I spent my summers and many weekends throughout the year in Chatham. It has always been our home away from home, the place to connect with family and friends. I am fortunate to carry on this tradition with my wife Ruby and son Liam. We enjoy sharing this wonderful experience with other families to create their own family memories . This house has all the comforts of home. Exceptionally clean, all rooms are nicely appointed with your comfort in mind. So peaceful you can hear the ocean at night. 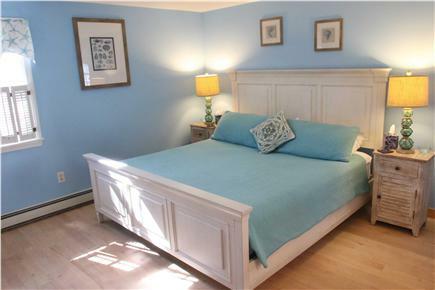 Totally renovated, bright & open, skylights, cathedral ceilings & maple hardwood floors throughout. Commercial stainless steel Italian 'Verona' duel-fuel stove, beautiful quartz “Sea Glass” countertops, backsplash & Nantucket Farmhouse sink. This year-round low allergen, open concept home has 3 new Boston Interior bedrooms, Master King w/ en-suite bath & Queen. 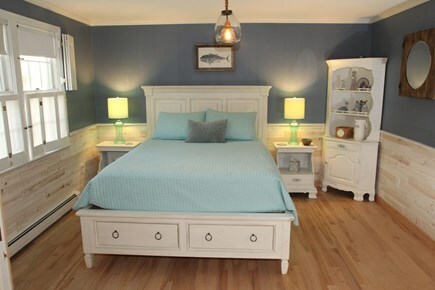 Guest bedroom has 4 nautical inspired design bunk beds children just love. 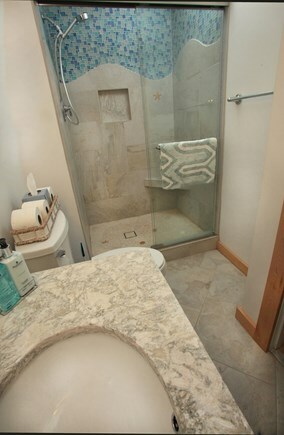 Newly updated baths, new front load washer/dryer & steam sanitizing feature. Large 2 level outdoor deck w/ electric retractable awning, creates a comfortable outdoor room w/ high-end patio furniture, commercial infrared stainless steel grill overlooking flower beds, vegetable & herb gardens for your use and enjoyment. All the creature comforts you would expect at home. High speed WiFi, Xfinity On-Demand, movie channels, smart HDTV voice activated remote, Blu-Ray-DVD, Wii player & lots of board games. The 26-mile Cape Cod bike trail is only a 5 minute ride & easily accessed. We even provide bicycles, as well as beach gear & towels to help make your days at the beach even more relaxing. 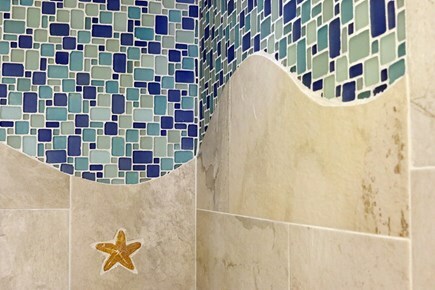 The outdoor shower is perfect for cleaning up after your day at beach. Just 5 minutes walk is a tennis court, basketball hoop with new kids climbing gym. One of the neighborhoods best kept secrets. This location is perfect. Chatham is centrally located on the Cape, far enough from the busyness of the village center to relax and enjoy the peace and quite but close enough to all the conveniences Chatham has to offer. 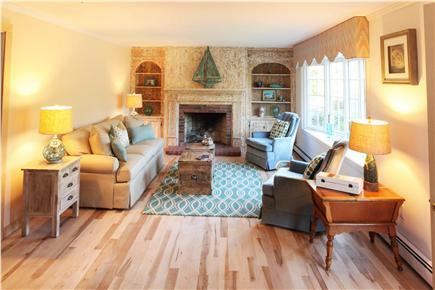 This relaxing Cape Cod home is only a 5 to 10 minute walk to forest beach, a natural beach on the warm waters of Nantucket sound. 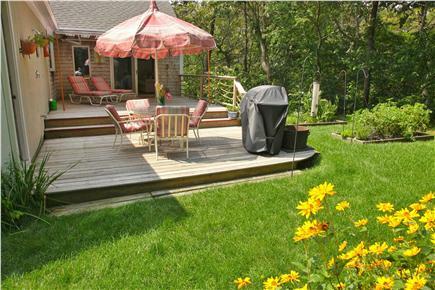 Located at the desirable South of RT 28, Forest Beach is 5 to 10 minute walk at 4/10 of a mile. This natural beach is unique and very private and does not require a parking pass or paid admission unlike the larger busier beaches. There are also several town beaches minutes away to choose from, each with its own personality or even a calm fresh water kettle pond. The beautiful Cape bike trail is only a 5 minute ride. There is even a newly surfaced public tennis court, basketball hoop with kids climbing play area within a 5 minutes walk. We even provide a selection of quality bikes in a variety of sizes for our adult guests and children to enjoy, including a couple Cannondale’s, Gary Fisher, even a beautiful adult Bermuda bicycle built for two, Trek Trainer and a Schwinn double tandem which attaches to one of the adult bikes.